Join us for a day of healing! 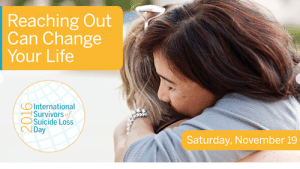 This year’s program includes a screening of Life Journeys: Reclaiming Life after Loss; a new AFSP-produced Survivor Day documentary that traces the grief and healing journey that follows a suicide loss over time. Drawing on stories and insights from long-term survivors, the file shows us that through resiliance and support we can achieve hope and understanding in our lives while celebrating the lives of those we lost.